GreenGeeks is a web hosting company established in 2006, based in LA, California. One of the true up and comers in the web hosting world, GreenGeeks has been quickly and somewhat quietly building an incredible reputation among business people and web professionals alike. The owner, Trey Gardner has over 30 years of experience providing web hosting services to the public. Depending on where you come from, you may know that we have a website management service. That’s how we have access to accounts with hosting companies like GreenGeeks, A2Hosting, and Siteground and a bunch of others. We know the sites we manage at GreenGeeks are in good hands. We rarely have hosting issues with them, and that means easier management for us. Then out of the blue, I have read this! I have jumped into the middle of it and created a brand new account with GreenGeeks. Setup was simple. They sent me an email that they will need to verify my payment, and I will get my access only after that. I will delve into more technicalities like uptime and cPanel. Data centers account for a lot of CO2 emissions. It’s becoming more and more important not only for environmentally conscious people but also for big companies. Green hosting is the solution for that. You might also find it comforting, that while you are blogging or running a successful online business, you help the environment. With 300% carbon offsetting, your carbon footprint will be a negative one. You won’t be causing any harm to the environment, rather have a positive impact on it. So How Green Are These Geeks Really? Looking to couple the worlds of web hosting, high technology, and renewable energy and green initiatives, GreenGeeks.com has been paving the way for more socially conscious web hosting and tech companies and is proving itself to be the leader in the green hosting arena, what the web hosting world needs so desperately. It’s a pretty unique service in that they aren’t just out there looking for a quick buck like so many of the other companies floating in the web hosting industry – they understand completely just how important it is to provide a knock out service and strive to do so to the highest standards possible. It’s not like you buy a piece of the server and left alone to figure out everything on your own. Support is there for you all the way. I found it quite extensive, with 24/7 live chat and phone support. As with virtually all web hosts I dealt with, they have tiered support, meaning that in case you face a more complicated issue, live support will likely not be able to solve your problem. It will be forwarded to second tier support via ticketing system, and they will solve it for you usually within 24 hours. This is not a model without flaws, but it has worked for us so far. cPanel is pretty much the standard among control panels. I prefer it to the other ones. cPanel at GreenGeeks is pretty standard with the features most retail hosting companies offer nowadays. I don’t want to write about cPanel here, that would be too long. I particularly like that they gave me SSH access. The important thing is that you can use 1-Click Installation of popular scripts like WordPress or Drupal. Ecosite Starter is the entry level plan at GreenGeeks. You get a pretty standard set of features. You can get this plan for as alow as $2.95, so it’s still an excellent value for money. The Pro plan gives you twice the performance. You get PowerCacher and send more emails. The price increase is steep: $6.95/mo. You get everything in the Premium plan. I particularly like the free PCI compliance and the 4x performance. You can use this plan for some serious business. You can accept credit cards, and your website will be much faster than with most shared web hosts. It comes with a price tag! At $16.95 it’s more than what most people can afford. There is a market for this kind of premium service though. HostingManual.net has also chosen a similar high-performance plan. Even though it’s more expensive than most shared plans (or even some VPS plans), we felt it’s worth the price. Virtually all hosting companies market themselves as a WordPress host. There are huge differences among some of those services. One of the best WordPress hosts I like is Siteground. They are WordPress optimized. So why not compare the two? I did! I have set up two skeleton WordPress websites and headed to GTMetrix. 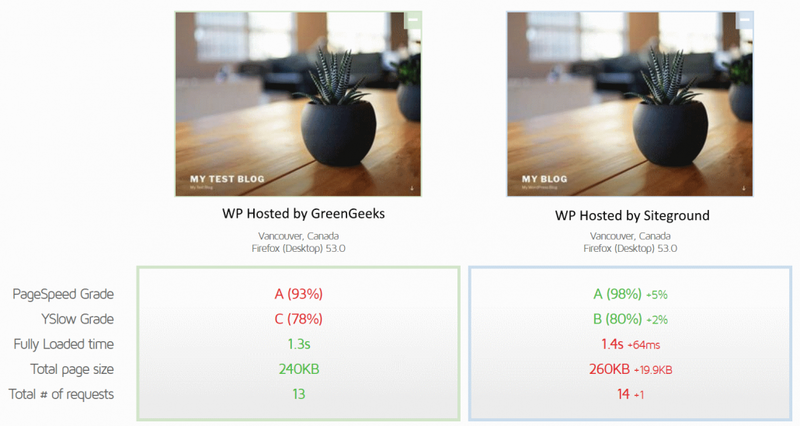 The results are incredible: GreenGeeks matches one of the best WP hosts in the industry. The comparison is not exactly 100%. For some reason, the page size is bigger on Siteground than on Greengeeks. I have removed all the plugins and content, so both were bare minimum using the same theme. 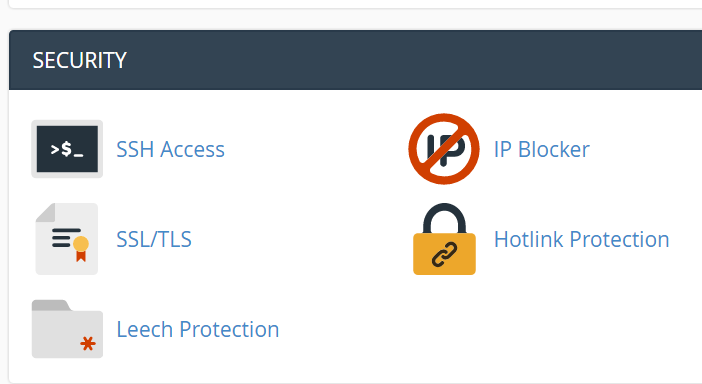 Let’s Encrypt’s free wildcard SSL certificates let you secure multiple subdomains. You set it up on your main domain, and all its subdomains will also be SSL protected. So how wildcard SSL is different from a simple SSL certificate? It lets you use it on any number of subdomains (e.g., subdomain.yourdomain.com). For most people, it doesn’t make a difference, but for some people, it’s a must. Many web hosting companies put as many customers on a server as possible to increase profits. That’s not the case with this hosting company. They don’t crowd customers, and this means better speeds for your website. They do make sure that if something happens in spite of all these measures, your data won’t be lost. They make nightly backups. Inc 5000 List – They have made the 5000 fastest growing companies list. EPA Green Power Partner – They have been invited to the United States Environmental Protection Agency’s Green Power Partnership. Featured in PC World – PC World featured them multiple times. Accredited Business – They are accredited by the Better Business Bureau. The advantage is simple – not only do you get an incredibly robust web hosting platform for right around $6 a month, but you’re also helping to support a green business (where energy efficiency, waste reduction, and green initiatives are all as important as profit) along the way. Priced right around most other comparable web hosting providers, they make it a no-brainer for anyone looking to host a website or fleet of websites and help pave the way for the future at the same time. The Green Movement is in full swing, and GreenGeeks fully embraces it. It’s possible to cancel anytime. For new accounts, there is a 30-Day Money Back Guarantee. If you don’t like the service, you can cancel and get your money back. Please note that a domain fee will be charged, because this is a cost for web hosts too. You not only get a green solution for web hosting, but you deal with a team who also understands that first and foremost it’s a web hosting company – you can expect unlimited (with normal usage) resources (bandwidth, disk space, add-on domains, email addresses, etc.) coupled with incredible speed and reliability as well. This makes for a perfect web hosting solution for small business owners, freelancers, professionals – even someone looking to build a personal site could take advantage of the incredible fleet of tools and technology that GreenGeeks.com makes available to all of their customers. The domain registration fees are not the cheapest. You get a refund only in the first 30 days. If you ask for a refund, you will have to swallow the expensive domain registration fee. I have seen an uptime of more than 99.9%. That’s pretty much standard among the web hosting companies nowadays. You can play around with our uptime calculator to see what downtime means for your website. While this web host is targeting a specific niche in the web hosting world, that shouldn’t dissuade anyone from trying out their service. I’m glad I gave them a run through for my review I’m writing now, and there is a fantastic possibility that I stay on as a customer with them in the future. I love the idea of helping the planet through innovation, and if you’re given identical options for web hosting but can also contribute to the green innovative. I think it’s a no-brainer where you want to spend your money. If you’re looking for a stable web host with all the bells and whistles, as well as some of the best marks in the industry for reliability, customer service, uptimes, and innovations, then this green company is where you need to head to for your next web hosting project. Armed with a professional and friendly staff, easy to use tools and technologies, and a brilliant business team GreenGeeks is going to be poised to make a run at the top dog spot in web hosting. If you want to see what others are saying, you can check out these customer reviews. 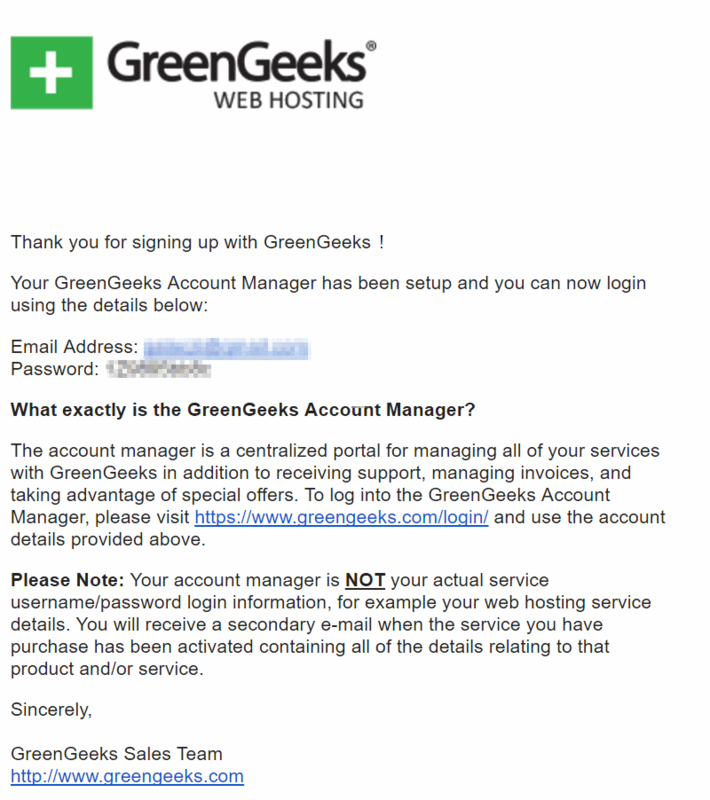 Disclosure: I am an affiliate of GreenGeeks, and I get a commission when you click a link and purchase hosting. That’s how I maintain this website. It doesn’t cost you anything. In fact, I can guarantee you get the best price when you are using my links. How much Bandwidth and Disk Space do I need? I have rated GreenGeeks 4.5 out of 5. GreenGeeks is in the top 5 of my reviewed web hosts. They provide one of the fastest shared hosting services we have tested. Looking for GreenGeeks alternatives? Check out Bluehost.